Have you seen some of these weird plants? 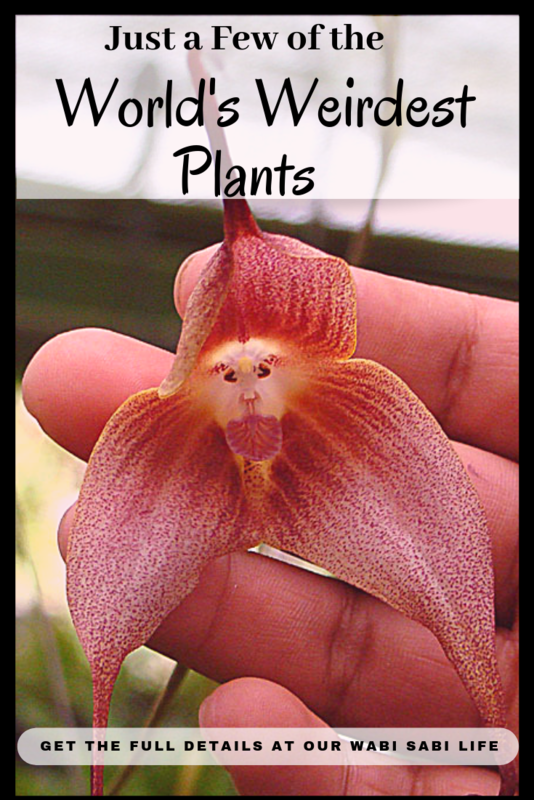 There are plants that resemble a monkey’s face, a plant that smells like death, and some that look like skulls. Check out these World’s Weird Plants. I love plants. I love gardening. These are some of the things that I do in my free time. The girls and I are always looking for new plants to grow. It has become one of the things we do together all year long. Right now, we are searching for what plants we want to grow in our containers in the backyard. one of these weird plants is my favorites. Keep reading to find out. 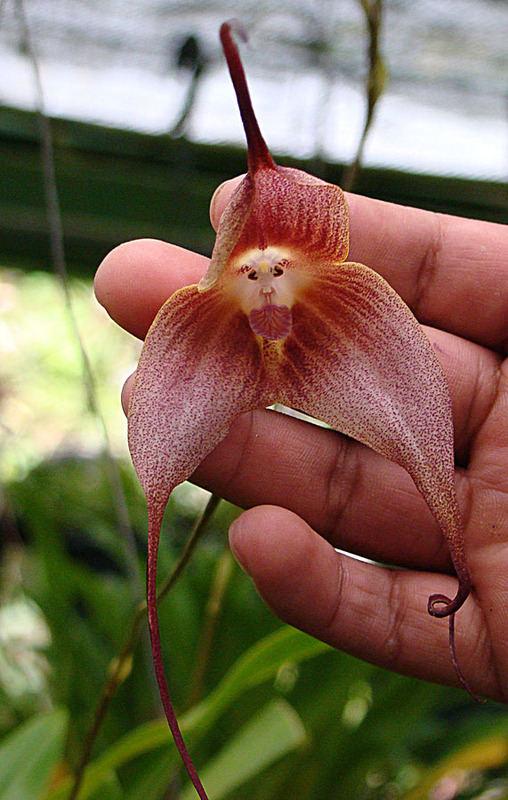 First up on our list of strange plants is the Monkey Face Orchid. I love orchids. My son gave me an orchid for Mother’s Day a few years ago, and I look forward to watching it bloom each year. My orchid is a regular orchid and does not look as cute as this strange plant. Look at that face. The 2 dark eyes and a fuzzy dotted eyebrow, furry nose and beard have a striking monkey look that most people can spot even from a distance. The Monkey Face Orchid is an oddity. When found in the wild, the Money Face Orchid is only found in the cloud forest of Peru and in southeastern Ecuador at an altitude of more 3,000 feet. Smelling like ripe oranges, the Monkey Face Orchid blooms all year round and thrives in warm weather. Some of these rare orchids grow large, down-turned pointy petals and others produce smaller fuzzier flowers. I have always loved passion fruit. I never knew what the flower of the fruit looked like, but it is now a favorite. Isn’t it gorgeous? It reminds me of a sea urchin. 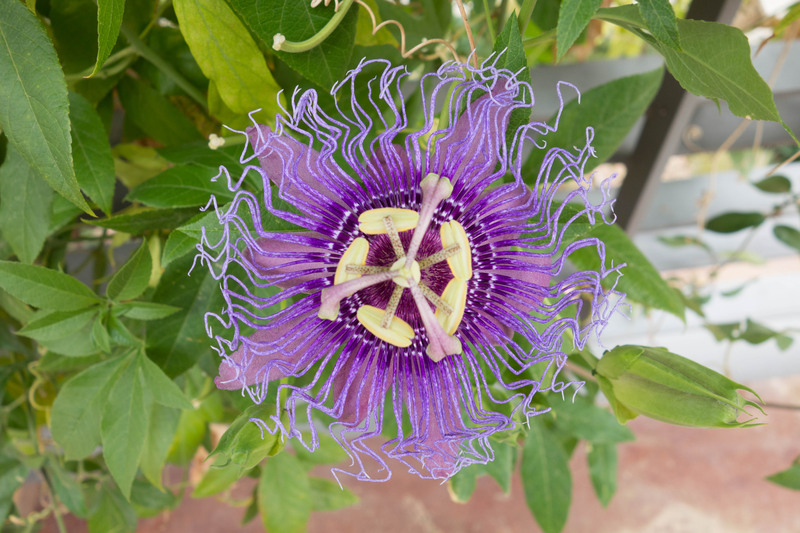 There are over 500 different varieties of the Passion Flowers. This species looks like a sea anemone. The Passion Flower produces an amazing scent. 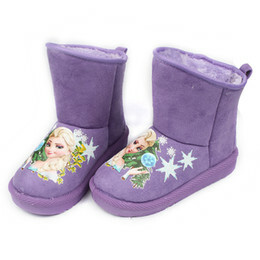 It is often used for homeopathic remedies to help with insomnia and anxiety. It is also a great food source for caterpillars and butterflies and is regularly grown on butterfly farms. Next up on our list of weird plants is the corpse lily. This is one of the strangest plants I have ever heard of. It has this very strange appeal. I don’t know if I should run or love it, but it is interesting. The Corpse Flower is a unique one. This monster of a flower can grow up to 12 feet tall and can weigh up to 200 pounds. It blooms so rarely that when it does, it often makes local news and sometimes even global headlines. It gets its name because the scent it gives off is reminiscent of a decomposing body. The scent is to attract insects for pollination. Next on our list of strange plants is a plant that looks like a rock. These succulents look like it has a flower growing from the center of a rock. If you have a black thumb, this might be a plant for you. Know someone who says they can not have flowers or house plants because they forget to water them and they kill every plant they have. This is the plant they need. Lithops are small succulents from South Africa and are essentially a drought-proof plant. 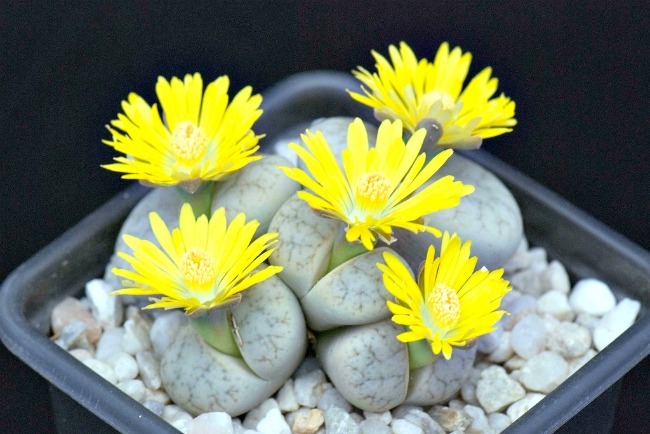 Also known as a Living Stone, Lithops start off with only 2 leaves. Every year, the old leaves die, fall off and the moisture that is inside the leaves is used to grow a new pair. Each year the leaves doubles and this goes on as long as the plant blooms. Want to grow more Living Stones? Take one of the leaves and add it to a rock bed. It will take roots and start to grow. When Lithrops bloom it looks like a white or yellow daisy is growing out of a stone. THIS IS ONE OF MY FAVORITES! Way before I saw a seed pod, I have always loved snapdragons. I think they are absolutely beautiful. The fact that the seed pods look like this, is just a bonus. You think your neighbor has tiny shrunken heads in their garden? Nope! they are just the seed pods from snapdragons. Many people know snapdragons as the beautiful flowers that you can squeeze at the base and they open and close like a dragon’s mouth. 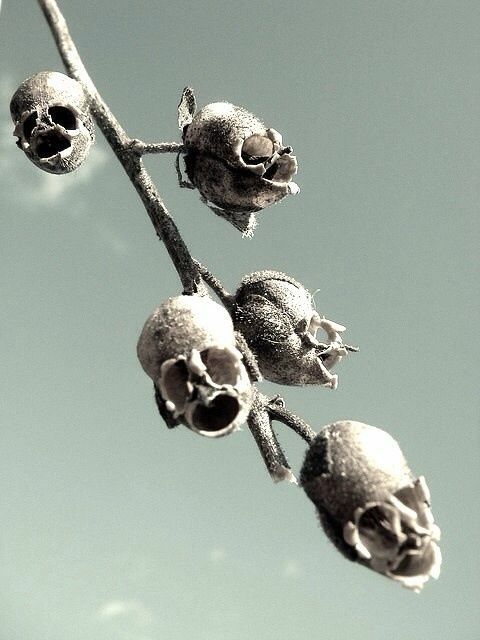 This way cool looking skulls is what is left behind once the seed pods have dried up. This looks just like a beehive, doesn’t it? Called beehive ginger, it is a stunning plant to look at. The Beehive Ginger looks like it might be part of the pine cone family but it is actually related to the ginger plant family. The bracts, the little cups or honeycombs, of the plant will collect water and makes it smell like ginger. Tiny white flowers come out from between the bracts and look like tiny honeybees sitting on the honeycomb. The bracts turn from a pretty yellow and gold to red. 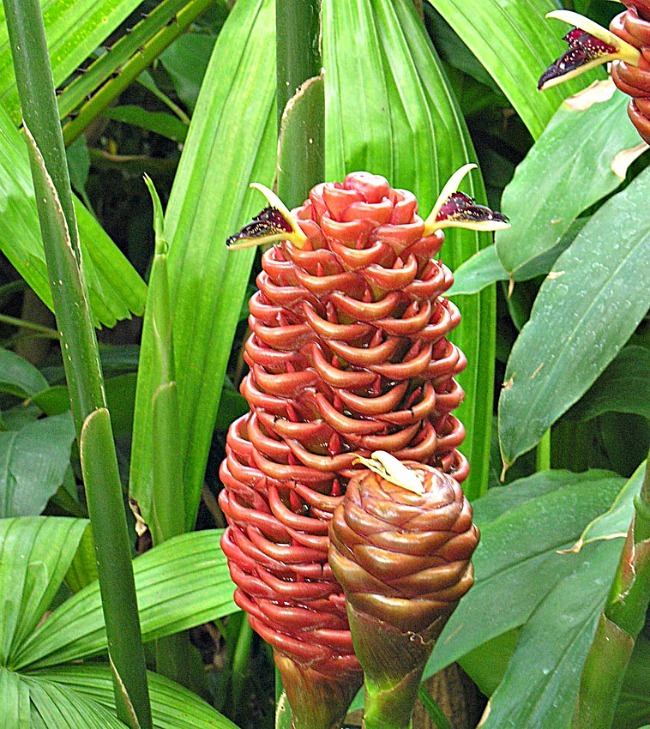 The cut flowers and bracts of the Beehive Ginger are sought after because they last for a long time after being cut. These plants take up a lot of room and can grow to be up to 6 feet. I love how unique all of these plants are. I plan on getting several of the “Living Stones” to have around the house. I also want to see if I can grow passion fruit plants in our zone.